Dr. Susan Goldstine, Associate Professor of Mathematics at St. Mary's College of Maryland sent this photo, in 2014, after a workshop in Maryland in November 2012. After your visit to Southern Maryland, I got very very busy again, as can happen if you're not careful. 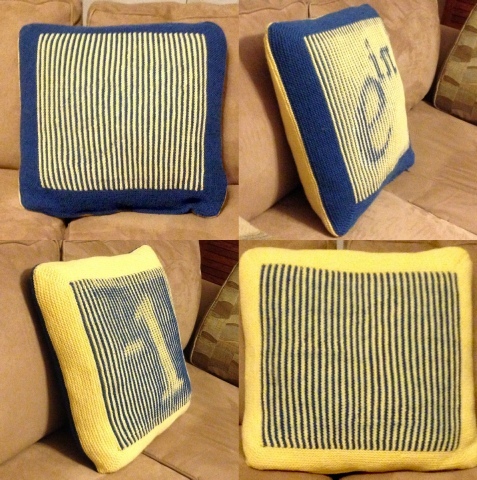 In the midst of my work, I put together an illusion knitting piece to embellish the department, which has couch cushions in the school colors, blue and gold. The project languished for a while after I knit the illusion bits waiting for me to turn them into a cushion cover, but I finally installed the cushion last fall. Here's a composite image taken on my couch at home. I'm pretty happy with the result, though now that I've done it once I think I could do it better. Thanks for the lovely workshop. It was great meeting you and Steve, and my pleasure to show you the sights.